The CAO Gold line offers a flavorful smoking experience to every cigar connoisseur who tries these hand-rolled premium cigars. Master rollers at the CAO factory in Nicaragua meticulously craft each CAO premium cigars using the finest Nicaraguan long filler tobaccos and binders, bound-up inside an elegant Ecuadoran Connecticut seed wrapper. 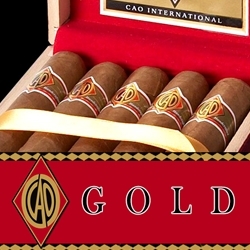 CAO Gold cigars are soft to the touch with the oils visible on the surface. A mild-bodied cigar that produces a smooth, effortless draw each and every time. It’s no wonder the industry’s top publications have given CAO Gold multiple 90 ratings. CAO Gold cigars can be delivered right to your doorstep so you can kick back with a great smoke, relax and unwind. Smokers Discounts has made it easy and affordable to buy premium cigars online. A variety of sizes and flavors are listed below at our discount online cigar store. Each of these styles are in stock and available. Call us for more details!